Orkut is one of the popular social networking sites in India as well as in Brazil. 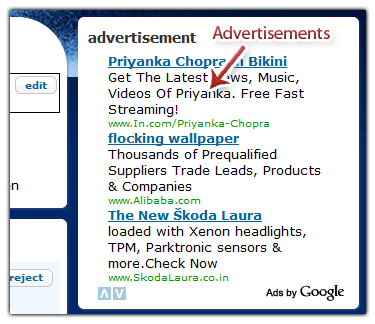 Advertisements are the only way for Google to keep Orkut running. From the past few weeks, you may have noticed that Orkut has started showing ads on top of the pages. Earlier it was used to show ads below friend’s bar. That was somewhat avoidable but now it looks too ugly. If you are a Firefox user, you can easily remove these annoying ads. Install Orkut and MySpace Advertising Remover to Firefox and restart your browser. That’s it. Now you can chat with your friends on Orkut without those annoying ads :). The screenshots do not work for me but I remember how it looked. I like the new version better I think. At least the ads are not in the middle of the site.